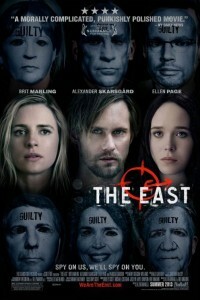 In the movie The East, Sarah Moss (the annoying, needs-to-go-away Brit Marling) is a brilliant operative for an elite private intelligence firm whose top objective is to ruthlessly protect the interests of their A-list corporate clientele. She is assigned to go undercover to infiltrate an anarchist collective known for executing covert attacks upon major corporations. Living amongst them in an effort to get closer to their members, Sarah finds herself unexpectedly torn between two worlds as she starts to fall in love with the group’s charismatic leader, finding her life and her priorities irrevocably changed. The East made its theatrical debut at the 2013 Sundance Film Festival, which showcases only pompous, independent movies. Brit Marling, who needs to crawl back under the rock from which she crawled out from under to plague all of us.